Make the most of your time in Houston with a 1.5-hour city sightseeing tour followed by a trip to Kemah Boardwalk, an amusement park located on Galveston Bay. After your narrated sightseeing tour of Houston aboard an open-top double-decker bus, transfer to a comfortable coach for an easy drive to Kemah Boardwalk. Enjoy several hours of free time to explore the amusement park rides, take a spin by jet boat on the bay and try the restaurants (each at own expense) before your return to Houston. Alternate vehicles may be used according to number of participants, weather or traffic conditions. Make your way to the meeting point in downtown Houston where your day starts with a 90-minute sightseeing tour of Houston’s highlights aboard an open-top double-decker bus. Ride past City Hall, Market Square, the Houston Heritage Society, the Houston historic district,Buffalo bayou,Mid-town and more as you enjoy unobstructed views of the city and live commentary by your on-board guide. After your Houston city tour, transfer to a bus shuttle that takes you to Kemah Boardwalk, located on Galveston Bay less than an hour’s drive from downtown Houston. 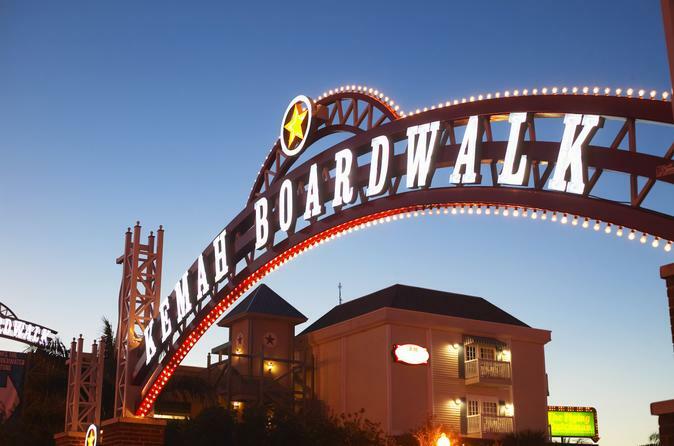 Considered one of the premier boardwalks in the United States, Kemah Boardwalk features a variety of amusement park rides, restaurants, shops and a marina. If you're looking for thrills, try the Boardwalk Bullet Roller Coaster, the most popular ride at Kemah. With 42 total track crossovers (the most ever designed into a wooden coaster), the twists and turns of this ride promise to make you scream with delight. The boardwalk also offers other adrenaline-pumping options along with classics such as a carousel, a ferris wheel and a replica of the 1863 CP Huntington steam train. Want to take a speedy spin on Galveston Bay? A jet boat named the Boardwalk Beast flies through the water and ventures about four miles (6.5 km) out on Galveston Bay. Be prepared to get wet as your boat reaches speeds of up to 40 miles per hour (65 kph). Tickets are required for all rides and can be purchased on-site at Kemah. When you get hungry, choose from a number of restaurants where you can purchase lunch or snacks. One of the boardwalk’s centerpiece restaurants is the Aquarium, where the dining room encircles a 50,000-gallon tank full of colorful fish, sharks and stingrays. After your fill of fun, meet your driver at the designated time for your return to downtown Houston, where your tour ends.